Gone are the days when the usual manner to pick out weeds in a garden is to poke the soil with a sharp stick. Even those used barbecue sticks made of bamboo were okay. You simply pierce the soil at base of the weed and attempt to loosen the surrounding soil of the weed. Then you slowly pull out the weed, hoping you get all the roots out also. 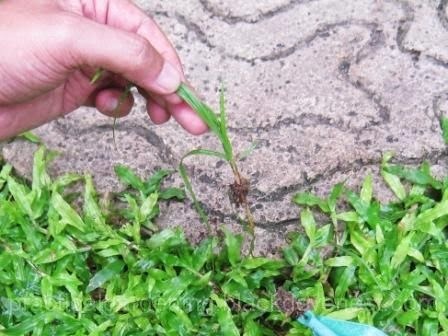 This method works conveniently if you only have a few garden weeds to pull out. That's because the sharp point of the stick becomes blunt or bent over time, and poking the garden soil becomes harder. Also, a straight implement such as a stick becomes difficult and painful for the hand and fingers after continuous weeding. For many, the typical 2-pronged garden hand weeder like the one above fits the bill when hand weeding the garden for an extended time. This is the position of the hand weeder when you actually use it. The garden hand weeder has 2 prongs at the end that allow you to pierce the soil and loosen it up. You may poke the soil several times or loosen it by prying it as you dig the 2 prongs. This hand weeder model also has a flat bottom metal pad that acts as a fulcrum. The fulcrum can be used to generate additional leverage as you pry up the weed from the garden soil. This helps prevent damaging the surrounding plants like lawn grasses. Finally, this hand weeder has a soft grip around the handle for more comfortable hand-weeding. Identify the weeds from your lawn grass. Their leaves' shape, size and color are very different from the grass on your lawn. Hold the tops of the weed's leaves together. This allows you to gain a firmer hold on the whole weed plant and reduces just tearing off leaves. Slightly tug the leaves upwards. If the soil is loose enough and the weed is shallow-rooted, then the weed is easily pulled out. If the weed is deep-rooted, continue tugging just slightly so as not to tear the plant from its roots. Remember, you want to remove as much of the roots as you can. 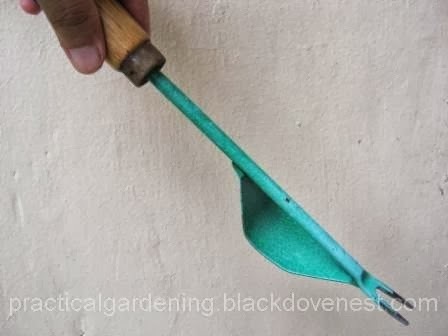 Still holding the weed with one hand, pierce the soil under the weed using the hand weeder as shown below. Pry the weed upwards by pushing down the handle while simultaneously tugging the weed upwards with the other hand. Use the hand weeder's fulcrum to gain leverage. If the weed's roots are still deeply anchored in the soil, pierce the soil further down the base of the weed. 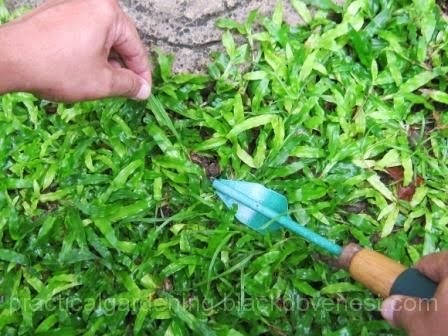 You may also need to pierce the soil surrounding the weed plant around its circumference to further loosen the soil. When you feel the soil giving and the weed's roots almost freed up, uproot the weed with the hand weeder so you easily lift the weed off the soil with its roots intact. Don't worry about getting clumps of soil with the weed. Unless, it's a big soil clump, I don't bother shaking all the soil off the roots. Use a small stool when hand-weeding the lawn. Bending while standing to hand-weed the lawn is bad for your back. 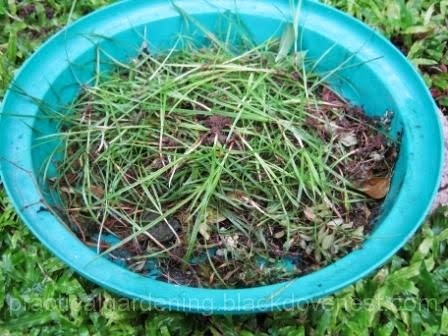 Use a weed bucket to collect the pulled weeds. A plastic tray or basin as shown below will do. Don't worry about pulling out too much soil and some lawn grass. This cultivates and aerates the lawn. Be sure to put back the clumps of soil and pulled out lawn grass to the ground. Press on the soil with your hands.